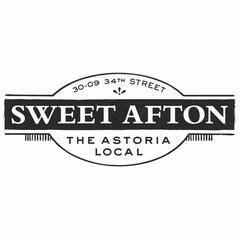 Sweet Afton is proud to be one of the first bars in Astoria's new wave of craft cocktail and beer-focused destinations. Since opening in 2009, it has become a true neighborhood haven serving local brews and cask ales. Chef Nick Testa, a recent winner of Food Network's Chopped, prepares eclectic comfort food, Astoria’s best burger and the neighborhood's best brunch. Its lush outdoor backyard transforms into a luxurious enclosed dining room in the winter, making it a sought-after spot year round. Time Out calls Sweet Afton a "homey Queens gastropub...with the dim, dark-wood coziness of an Irish pub" and a "smartly curated array of reasonably priced suds." New York Magazine praises the bar as "shockingly friendly" and "charmingly well thought-out," with a "real, authentic neighborhood vibe" and an "honest emphasis on all things handmade and local. "<br><br>Sweet Afton is part of Sleeping Giant NY (harri.com/sleeping-giant-ny), a family of independently operated bars united by a shared work culture and the chance for employees to grow and explore opportunities across different locations. To learn more, please visit www.sleepinggiantny.com.